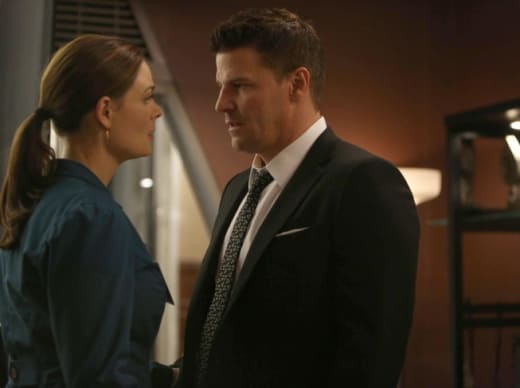 Following Stephen Nathan's preview of last night's Bones episode, in which the executive producer spoke on how "The Pathos in the Pathogens" would lead into next Monday's Bones Season 8 finale, Nathan is now back with many more intriguing tidbits and teasers. What sort of game will a returning Christopher Pelant be playing with the Jeffersonian team? Will Season 8 end on a high or a low note? Just how many tissues should you have nearby as you watch? TV Fanatic: It sounds like Pelant is going to be targeting Booth. Is that what he’s doing? Stephen Nathan: Well, what he has done in the past is very different than what he is doing now. In the past, as Sweets kind of points out in this episode, Pelant somehow feels that this whole group is like an extended family for him. He’s very close and intimate with all of our people so that everybody has a very important place in Pelant’s life. At the end of the last Pelant episode, Booth shot him and that changed the rules of the game. He had not hurt any of our people. He had not specifically gone after them. The game was to see who was smarter. Lives were lost in the process, but really the game was played between Pelant and our people, whether it be the FBI or the Jeffersonian. But now the rules have changed and the people who are dying are people who we realize are close to Booth. The intimacy that Pelant has counted on has been somewhat shattered. He is playing a new game now. TVF: How does Hodgins deal with his reemergence because he almost lost it in the previous episode where he could have killed him and didn’t. We saw a different side to Hodgins. SN: He is definitely dealing with that in the finale. TVF: We’ve talked before about how Pelant basically knows the team works best when they’re together, so it sounds like this is the perfect timing for him to come in if they’re all kind of fragile. Is he aware of this fragility that they all have? SN: You’ll see when you see the finale that he knows a lot more than we even think he knows. He has found a way to tap into the grid using surveillance cameras and things like that. All of this is true, by the way, that any surveillance camera that has an Internet connection, any surveillance camera that shares servers, these are things that Pelant can access. So, he knows what’s going on. TVF: Do we find out if he’s got some other minions working with him? Do we find out anything about that? After watching The Following it makes me think he probably has others doing his bidding. SN: Yes, we do. Yeah, we do definitely find that out in the finale. I have to say, there might be similarities in passing with The Following but they’re only in passing. It’s a very different situation. TVF: Is it safe to say that we will lose somebody that we know? SN: No, it’s not safe to say that. It’s not safe to say either we will or we won’t. I hate to be so vague and cryptic…we should all be worried. TVF: How is Brennan handling all this, especially if she knows that Pelant’s targeting people in Booth’s life? SN: It probably has the biggest impact on Brennan. Brennan who always feels that she has it together knows exactly how she’s going to approach life. The past three episodes have affected her probably more than anyone. She’s looking at life in a very different way now. I think this surprises her most of all. She is really going to be looking at herself, her own life, the choices that she’s made and how she wants to see her life in the future in a very, very different way. TVF: Is Christine around or is she off in safety land somewhere? SN: No, Christine is around. She’s definitely in the finale. TVF: The show feels as alive as ever. Do you guys attribute that to anything outside of your fantastic writing? SN: I know it sounds odd but we don’t feel as if we’ve been on for eight years. I mean the characters give us so much and the actors give us so much. They kind of feed us to move the series forward. I think if we’re treating the characters with a certain respect they return the favor by showing us directions that they’re headed that we might not even think of. Booth and Brennan have such rich lives and such interesting histories that just exploring that effects how they change in the future. TVF: Last question, does the finale end on an up note or a darker, scarier note? SN: I would just say for those who have a penchant for tears, keep some Kleenex nearby.